Shambala Oceanside Retreat offers you a serene environment for exploring massage, wellness, YOGA, meditation, vegetarian food, snorkeling, dolphin and nature excursions, temples, village life! * The Krishna House, in lavender tones with a King sized bed upstairs. * The Radha House, after Krishna’s famed Beloved, with a Queen sized bed in blue tones. Each Villa has a balcony with a grand view of the ocean, where you can watch both the sunrise and sunset, depending on the time of year. When you awaken in your bed your eyes can roam the vast expanse of the ocean right before you. At night only the stars and the twinkling lights of the fisherman’s boats at sea will dot the ocean and you will feel as if the world is yours. You will find a King bed with a writing desk which looks out over the ocean. The exquisite bathroom is a work of art. If you prefer to have the entire villa, please email us for a discount price. 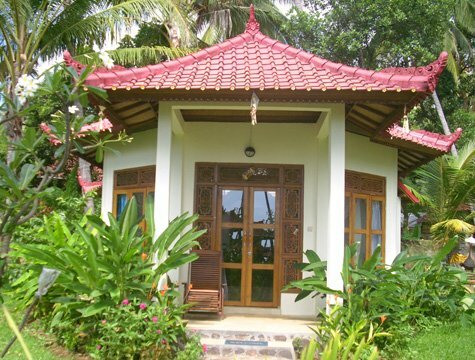 Our single story Octagon Bungalows are set in the garden, facing the Temple in the center of our retreat. 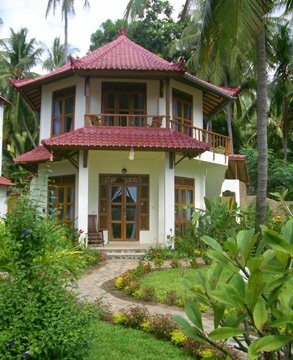 Each bungalow has its own veranda from where you can see a little bit of the ocean, which is only a stone’s throw away. Our Double Story Garden Villas have two floors, which can be rented separately for one or two, people. Or you can rent the entire house for you and your family. Each floor has its own equally beautifully created bedroom and bathroom, with King beds, and the bottom floor features a King bed as well as one Single bed. The décor and style of each floor is exactly the same as our Oceanfront Villas, with each house featuring a different color scheme. The Quan Yin House as well as Rajinda House also feature a writer's desk. 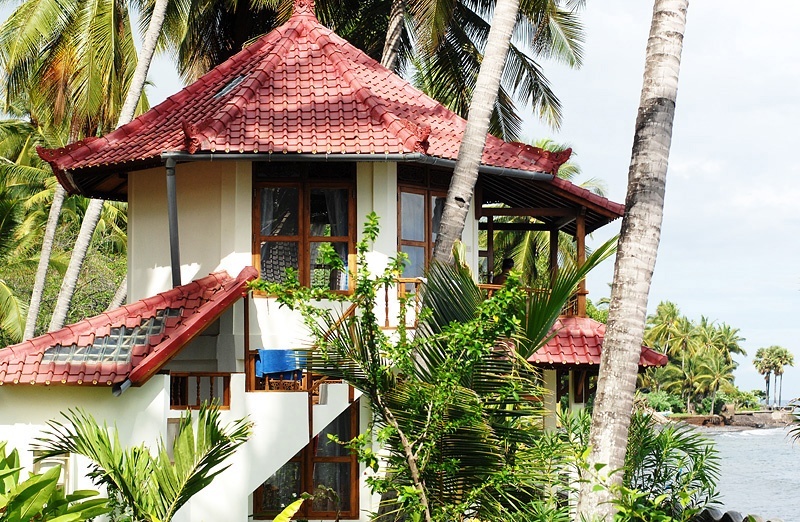 Our Double-Story Garden Villas have two floors, which can be rented individually for one or two, people. Or you can rent the entire house for you and your family. And as you sit on your patio or balcony you can gaze onto the near by ocean. Your oceanview will only be dotted by the shade of overhead palm trees. Or you can join us at the swimming pool just steps away, or lounge in of our typical Balinese Bale: a wooden structure with a rice-hatch-roof giving you ample space to visit with friends or read a book and to lounge in its comforting shade, the way Balinese still spend their day today. Here you will find a living room with a carved daybed which invites you to lounge, read a book, daydream or visit with new found friends. Each oceanfront villa a wooden carved daybed for one person on the ocean level, along with an exquisite set of a table and rustic chairs. 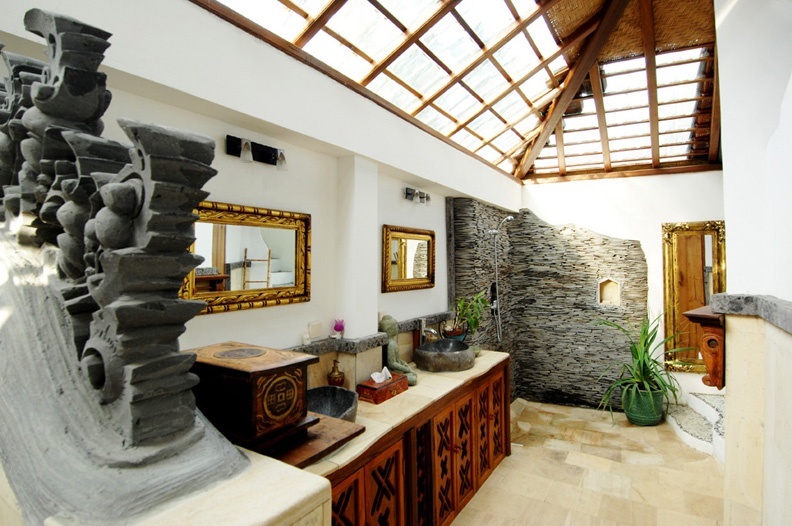 The bathroom is a delight with Balinese temple carving and the most amazing rock shower. Each veranda just outside the living room has a rocking-laying chair for you to enjoy your oceanview. Downstairs as well you will find an artistically crafted bathroom which will make you feel like you truly are in a whole new world. Sunfilled bathrooms,with an open-air design will be a feast for your eyes. Here you will find a living room with a carved single bed which invites you to sleep comfortably listening to the ocean waves. 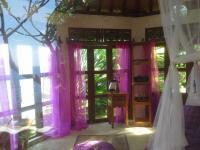 In Radha, we have also added a second single bed with a view of the ocean. 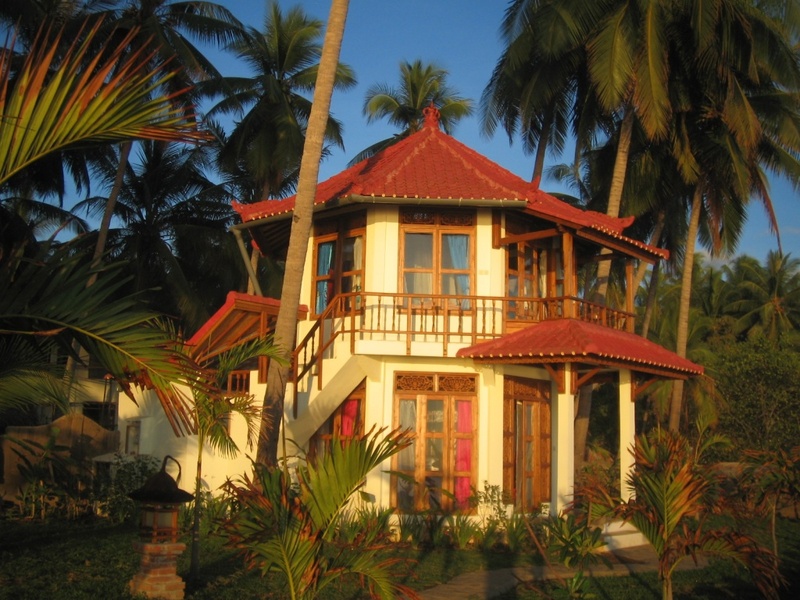 Radha has an extended veranda with creative benches and chairs made from old Balinese boats! You will also find an artistically crafted bathroom which will make you feel like you truly are in a whole new world with Balinese temple carving and a unique stone shower. Sun filled bathrooms,with an open-air design will be a feast for your eyes. 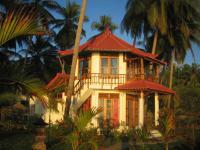 Enjoy not just a room but an entire free standing, single story octagon house, with its own veranda, with ocean view. 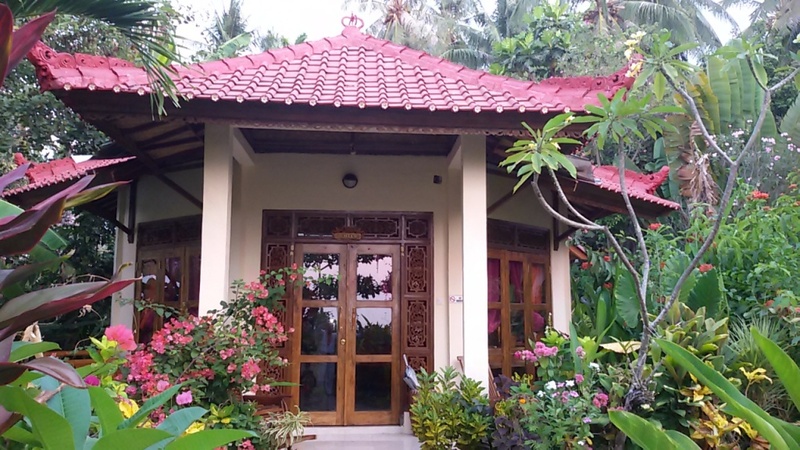 The house is light filled, with a colorful decor, with a traditional tall pitched roof, traditional temple carving on the wall, with massive, carved wooden beds fitted with luxurious mattresses, mosquito nets, and marble floors. The PURA KECIL, a single story oncean side bungalow, in pink-lavender tones, with a SINGLE STORY BUNGALOW is located right on the Ocean, with a King sized bed OR two Single beds, with a private veranda. This single story Villa has a grand view of the ocean, where you can watch both the sunrise and sunset, depending on the time of year. When you awaken in your bed your eyes can roam the vast expanse of the ocean right before you. 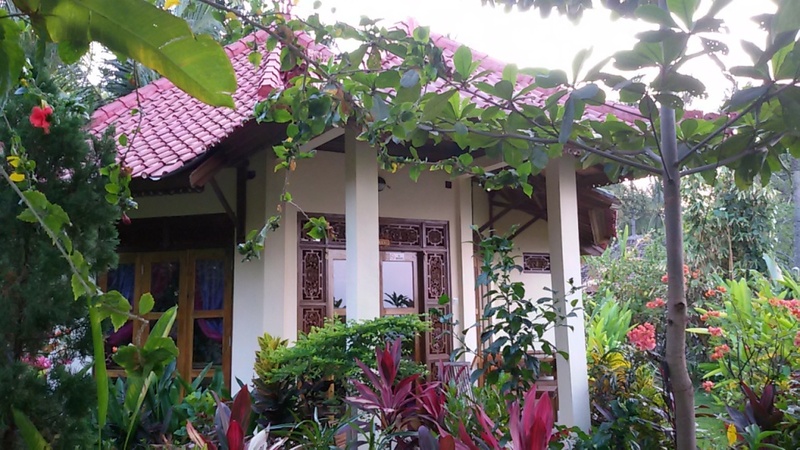 This bungalow is furnished in pink/lavender colors, and has its own veranda, a small pond with a waterfall, laying chairs in front of the house under the shade of trees, or in the sun by the pond. It also has its own patio with a table, chairs and umbrella. During a magical moment in October of 1999 on my second journey through Bali, I, Ilona Selke, met a very old seer in Ubud, maybe 115 years old, who gave me a reading. In a puzzled way he told me that we are neighbors. He had no idea what that meant, if it was the future, the past, or now. I had no idea if my seer was good or not, there was no way to tell. Time only would tell. 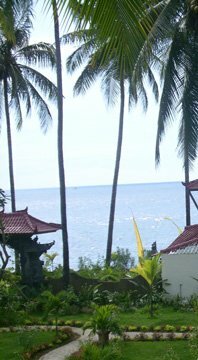 But one thing was for sure: I had no intentions to live in Bali, as my husband and I had our winter home in Hawaii and we were very happy there. A friend of mine who had accompanied me to the Seer also got a reading from him. 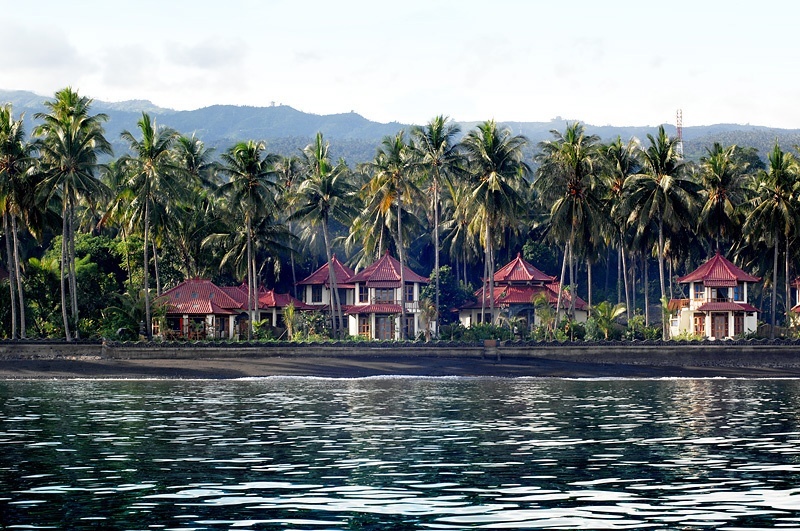 ShangriLa Oceanside Retreat and Spa is located in Bondalem, on the north shore of Bali. Since there is no address system in this part of Bali, it would be best to call our manager for directions or pickup. Right outside our door steps, off our gentle beach, we offer a great protected reef, which offers you great snorkeling, and even diving. Floating in water is one of the fastest ways to de-stress. There is something magical in seeing the light patterns under water, feeling yourself gently floating, and being absorbed in an utterly different world of colors, silence and vastness. In the early morning, just before sunrise, you will join the fishermen awaiting you in his outrigger boat just outside ShangriLa. Just you and maybe one other guest, plus the fisherman will venture out to see the dolphins, which frequent the ocean on the North Shore of Bali daily. The day is starting to break as you putter about 20 minutes out to sea. The shoreline of Bali is legendary, and will give you a very beautiful sunrise. We will look for wild pods of dolphins, who travel the northern shores of Bali in the early mornings in search of fish. Many times we have been graced with pods of dolphins, some large with numbers up into the hundreds, surrounding your outrigger boat, sometime small pods, but close enough to see well. The Island of the Gods has many temples at home an in town. On special occasions you will see all villagers dress in their most beautiful dresses to go to the Temple and honor the divine. The PURA, a Balinese Temple, is the centerpiece to Balinese life and is revered to this day. Belief in a higher force is as important to life as the daily rice. Depending on the time of year and month which you visit Bali, you will be able to witness many ceremonies. 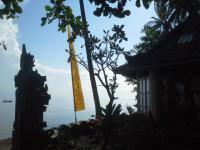 At night you can hear the priest call out Balinese chants and lull you to sleep. 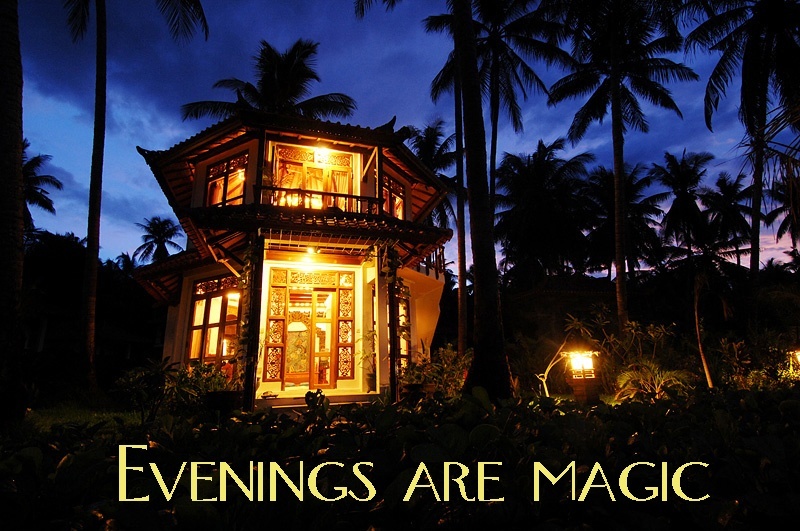 Or on full moon nights you may want to participate in a lively evening Temple event. Dancers and blessings will be bestowed upon all who are willing to sit on the ground for two hours under the full moon light. Even if it is not full moon, we will also able to visit the Karma Temple during the day without a ceremony going on, and explore the Temple grounds on our own. We may even have the chance to get the blessing of a priest. It all depends on timing and fortune. Edy will gladly accompany you on a visit to the Temples and advise you on the proper dress and behavior, as well as give you lots of information. The Balian is a healer that can help you by using Balinese traditional medicine which involves intuitive seeing, sensing, appropriating a special traditional medicine, or giving a massage if a person has problems with muscles or joints. A Baliane assists in atuning your energy, seeking to understand the origin of your unwellness, and she will attend to you physically as well as spiritually. The Dukun is a Seer who employs speaking with spirits, looking within the soul, viewing the Karma and helping to avert difficulties. The Dukun we know in Ubud has impressed us by his repeatedly valid council and visions he has shared with many of our seminar clients. Before coming to Bali it is best to make inquires via email to make an appointment in advance, since the Dukun only works according to the Balinese calendar, assists in many celebrations, and may not be readily available at an instance notice. Please email our office click here in advance if you wish to make a booking with the Dukun in Ubud. Ubud is a two hour car ride from ShangriLa and we would suggest to enjoy Ubud for the day. We will contact our local guide in Ubud by the name of Made Widia to arrange a time for your visit with the Dukun. Please be advised that you need to honor your booking requests. There is no set fee for your visit with the Dukun as he strictly works on donation, however we wish to make sure that our guests do honor their appointments. We will start with a car ride to the parking lot about 25 minutes from the waterfall. Here you will be met by our local guide, a young man, named Gede, who will guide you on a trek through the jungle forest, through rich fruit trees, explaining the many plants, fruits and fauna. At a very small little farmer's village you may want to ask a farmer's child to pick you a fresh coconut from the tree. Then continue along a gurgling stream and wade in cool water until you arrive at a breathtaking 50 meter tall waterfall which awaits you for a refreshing shower in nature. Or you can sit quietly in meditation near the shrine by the waterfall and enjoy the strong chi surrounding you. We will tour the next door small local fishermen village and observe the daily life of the fishermen and their family. They will show us their housing, their cooking space, bathrooms and animals. We will get a good feeling of how the fishermen lived a long time ago and still do today here on the north shore of Bali. This is truly rural life! Many fishermen have another house in town but prefer to live close to their boats, a very simple life, because it gives them peace and meaning. Edy will accompany you, and with him as your interpreter feel free to ask questions, as the fishermen feel very honored to show you their life and enjoy having you as a guest. 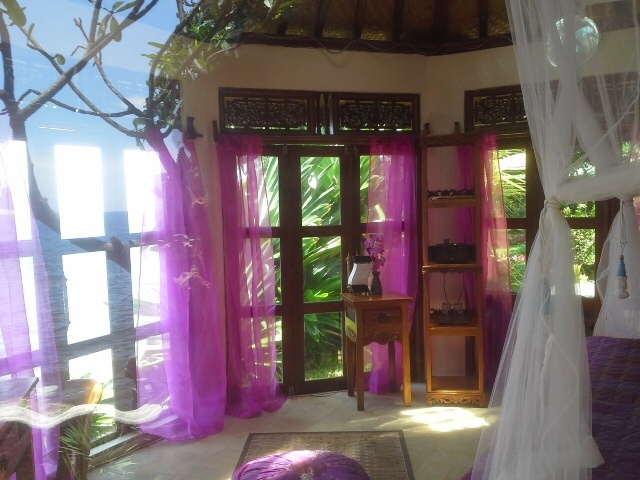 We offer our guests at Shambala a daily morning YOGA workout program that's very easy to learn. It will soothe your soul while toning your body! DEWI our YOGA teachers leads your Yoga Class on a donation basis of 50.000 Rp per person, with a minimum of 2 persons. DEWI, our YOGA Teacher on site, who will lead you through beginners morning YOGA exercises. Our very gentle exercises, which can be done by any beginner, will help you strengthen your cardiovascular system, tone and stretch your muscles, and improve your mental fitness. Once you realize the beneficial effects of Yoga, you may want to purchase our YOGA DVD with Ilona Selke to continue your daily Yoga at home. Start with 10 minutes of our unique sound table session, then let us soak your feet in warm water with flower petals, followed by half hour Foot Reflexology and half hour Head, Neck & Shoulder massage. Now enjoy a Full Body relaxing Oil Massage of your choice, and top it with a Salt Scrub made of essential oils. To look glowing all over we will give you a natural Facial treatment, as well as a Manicure or Pedicure. End your Day at the SPA with a luxuriating Flower Bath, alone or with your beloved, in a romantic setting, ending your Day at the SPA with candle light, which will take your mind to heaven. All 5 hrs for 550.000 Rp only. At Shambala you can be sure to be pampered by wholesome healthy food. We offer vegetarian food, mild to spicy, Balinese to European, depending on your mood. If we have a group we will offer BUFFET LUNCHES and BUFFET DINNERS. Please inquire about the cost. You can also order a partial Buffet. However our buffet prices are inexpensive. At Shambala you can dare to eat healthy, fresh salads, which I am sure you will enjoy. In Bali it is generally not recommended to eat salads or any form of juice which uses ice. However at Shambala you can rest assured that our chefs are diligent in their food preparation. All our food is washed in filtered and ultraviolet treated water and is safe to eat raw! Additionally to our Full Board food service, you can order fruit juices from our menu or create your own fruit juice mix, depending on the fruits available at the time. Or try our vegetable juices to give you health, and help you cleanse. Whatever your taste, come and enjoy your healthy and delicious meals at our Oceanside Restaurant and dreamily watch fishermen’s boats and on lucky days even may dolphins float by. Shambala Retreat is located right on the Oceanside and we have great snorkeling right outside or our gates. Our Swimming Pool, Beach Chairs, Benches and BALEs invite you to relax in the lush garden. We offer snorkeling equipment, paddle boards, and Kayaks, Yoga Mats, and bicycles for rent. Nearby is a 70 Meter tall waterfall, about 15 minutes by car from Shambala, with a 25 minute walk along a stream through tropical orchards.